Suitable For Ages: there is no recommendation from the publisher – the photographs are suitable for all ages, the text has some higher level vocabulary, but I think would be enjoyed by ages 5 and up. Brief Synopsis: This is a photographic story about a sloth sanctuary in Costa Rica. Wonderful photos of the many sloths-in-residence are accompanied by anecdotes and facts about sloths. PPBF bloggers, please add your post specific link to the list below so we can all come see what delights you’ve picked out for us this week! Would You Read It Wednesday # 79 – Twitch (MG) PLUS The February Pitch Pick PLUS Straight From The Editor! May The Force Be With You, Young Renn! i have never been so moved by a book, it had me in tears. 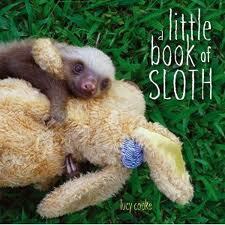 i just wanted to say if there is any justice in the world the film of the book of sloths should be made. sleep tight bay sloths. theres a sloth i no hes the only one i dream of reach into the stars take me to the clouds above.